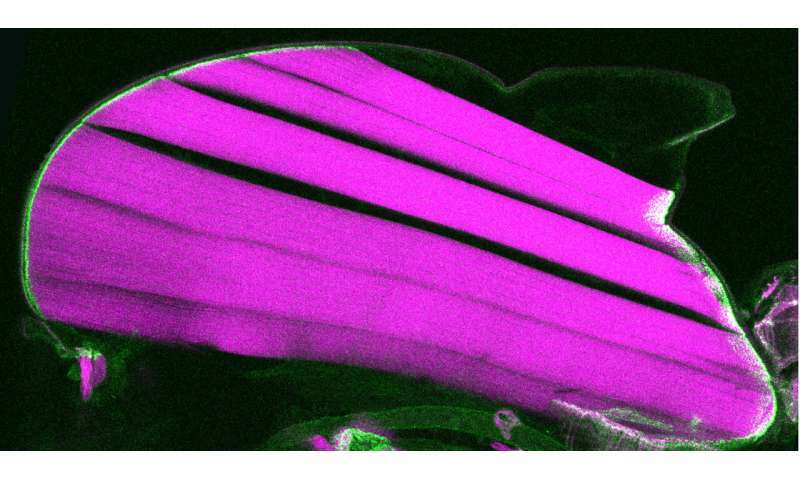 Lengthwise cut through the thorax of a fruit fly having an inserted force sensor in the talin protein. The force sensor on the muscle-tendon connections is green and the flight muscles are magenta. Credit: S. Lemke et al. Muscles are connected to tendons to power animal movements such as running, swimming or flying. Forces are produced by contractile chains of the proteins actin and myosin, which pull on muscle-tendon connections called attachments. During animal development, these muscle-tendon attachments must be established such that they resist high mechanical forces for the entire life of the animal. An interdisciplinary team of researchers from Marseille (France), Munich and Münster (both Germany) has now been able to quantify the mechanical forces transmitted by a key attachment protein called Talin. The researchers used the flight muscles of the fruit fly Drosophila for these molecular force measurements and found that a surprisingly small proportion of Talin molecules experiences detectable forces at developing muscle-tendon attachments. They also found that muscles deal with the increasing tissue forces by recruiting a high number of Talin molecules to attachments. This way, many Talin molecules can dynamically share the high peak forces produced during muscle contractions, for example while flying. "This mechanical adaptation concept ensures that muscle-tendon connections can last for life," says Sandra Lemke, a Ph.D. student in biology at the Max Planck Institute of Biochemistry who carried out most of the experiments. The study was led by Dr. Frank Schnorrer from the Developmental Biology Institute at Aix-Marseille University and Prof. Dr. Carsten Grashoff at the University of Münster. These new results have been published in the journal PLOS Biology. Earlier studies by the research group headed by Carsten Grashoff at the Institute for Molecular Cell Biology at Münster University had already shown that 70 percent of all Talin molecules are exposed to high forces in so called focal adhesions, when cells are placed on hard plastic or glass substrates in the laboratory. Therefore, the results of this new study are very surprising: Less than 15 percent of the Talin molecules "felt" measurable forces at developing muscle attachments in an intact organism. It is important to know that a muscle connected to tendon cells is in a much softer environment as compared to cells in a hard plastic dish in the laboratory. Yet, developing muscles must anticipate high forces generated during muscle contractions in the future in the adult fly. To prepare for that, muscles recruit many Talin and Integrin molecules in their cell adhesions.